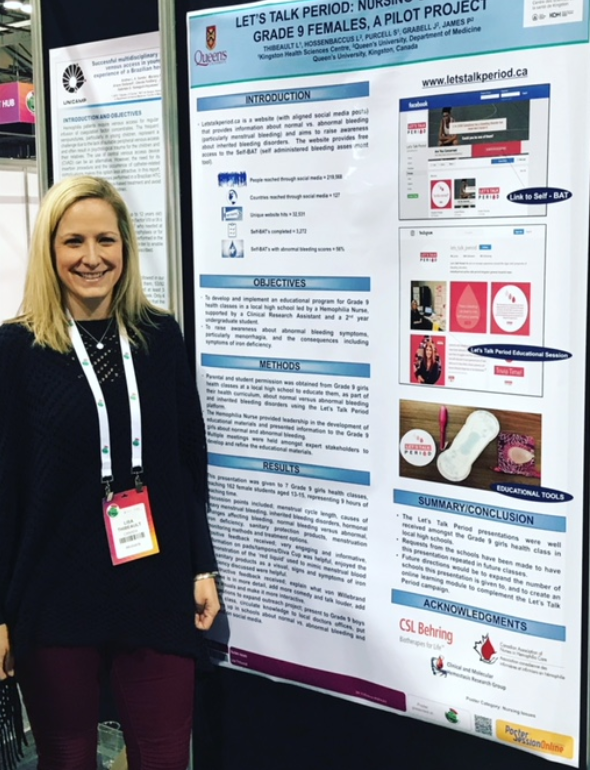 Lisa Thibeault represented Let’s Talk Period with a poster presentation (and published abstract) at WFH (World Federation of Hemophilia) held recently in Glasgow, Scotland. The abstract and poster were about the nursing role in the Let’s Talk Period high school outreach program entitled Let’s Talk Period: Nursing Outreach in Grade 9 Females, a Pilot Project. A summary of this project is below. Educating the general public about normal vs. abnormal bleeding can be a difficult task, particularly for menstrual bleeding. The goal of this pilot study was to develop and implement an educational program for Grade 9 health classes in a local high school in order to raise awareness about abnormal bleeding symptoms, particularly menorrhagia, and the consequences including symptoms of iron deficiency. Let’s Talk Period was given permission from a local high school to teach in a Grade 9 females’ health class at as part of their curriculum. The class discussed bleeding symptoms and inherited bleeding disorders using the Let’s Talk Period platform as the mode of presentation. The nursing role was to provide leadership in the development of educational materials and to present information in class about normal and abnormal bleeding through teaching about the menstrual cycle, demonstration of sanitary protection products, discussion of methods to monitor menstruation and strategies to decrease menstrual blood loss. This presentation was given to 7 Grade 9 girls health classes, reaching 162 female students aged 13-15, representing 9 hours of teaching time. Discussion points included; menstrual cycle length, causes of heavy menstrual bleeding, inherited bleeding disorders, hormonal changes affecting bleeding, normal bleeding versus abnormal, iron deficiency, and treatment options. This pilot project was well received and requests from the schools have been made to have this presentation repeated in future classes. To learn more about effective treatments or to continue the conversation, please get in touch with us by writing to us at the bottom of our website homepage. Join our communities on Facebook and Instagram to get regular information about bleeding disorders and help other women be empowered by this knowledge.